“Only three years had passed,” Lewis Warsh writes of publishing the journal Angel Hair, “but it felt like many lifetimes.” By 1969, when the last issue of Angel Hair appeared, Warsh and Waldman had begun publishing books--mainly because many of their poet friends needed publishers for their book-length collections, but also because The World, a new magazine published by the Poetry Project, was covering much of the same ground as Angel Hair. “I also felt,” Warsh says, “that we had made our point in trying to define a poetry community without coastal boundaries--a community based on a feeling of connectedness that transcended small aesthetic differences, all the usual traps that contribute to a blinkered pony vision of the world.” Just looking at the colophon for the last issue, one can see a roster of influential and now-recognizable names, not defined merely by poetry “school” or geographical location--Joanne Kyger alongside Frank O'Hara, Philip Whalen and Robert Duncan alongside Kenneth Koch and Tom Clark. Waldman and Warsh, after an amicable personal split, went on to publish books by Frank O'Hara, John Wieners, Gerard Malanga, Lee Harwood, Charles Stein, John Giorno, Clark Coolidge, Alice Notley, Bill Berkson, Ron Padgett, Tom Clark, Peter Schjeldahl, Kenward Elmslie, and others, including themselves. 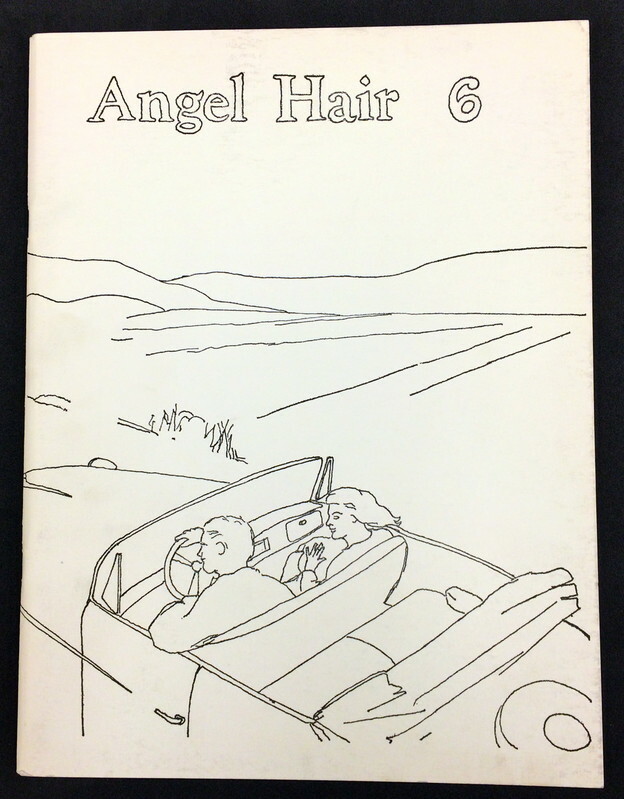 As Waldman describes, “a major consequence of Angel Hair's publishing debut books...was the launching of an array of young experimental writers, including ourselves, onto the scene and into the official annals as second-generation New York School poets,” though neither editor was comfortable with the “New York School” designation. Waldman, in her introductory essay for the Jacket feature on Angel Hair, wonders aloud “if Lewis and I would go about our press now in quite the same manner. With the same naive enthusiasm and optimism? I like to think so. We gave away our magazine and books, sent them out into the void.” Out of that void came many significant voices of modern poetry, voices that may not have been heard without the advent of Angel Hair. George Schneeman's cover for the last issue of the journal, which breaks completely with the plainness of past covers, captures the spirit of the journal itself--exploratory, collaborative, journeying, free--and also the moment of the journal's end, when its two editors, Anne Waldman and Lewis Warsh, headed off for new territories in their personal lives, their own work, and the ongoing project of Angel Hair.